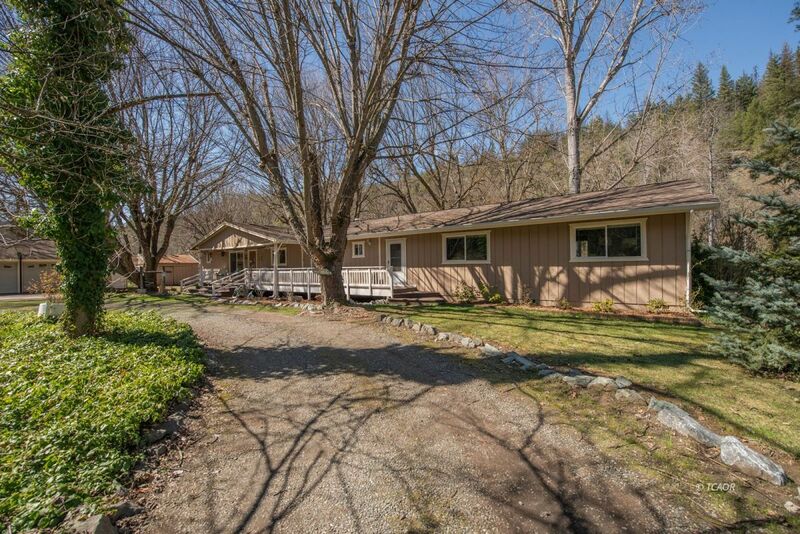 Home w/Guest Home on 3.44 acres & River Frontage! Beautiful home remodeled in 2017 & right on the Trinity River! Fish and launch from your own back yard, then soak in the sunset while BBQ'ing your catch of the day on the large back deck that overlooks the Trinity River. Great backyard for entertaining or just soaking up the sun. If you love gardening, there's plenty of room for that, with raised garden beds in the fenced in area out front, there's also plenty of room for an entire orchard. Step inside the home and you're greeted by a lovely kitchen, open to the living room, both with beautiful views of the river and access to the back deck. To the left and right of the main living space are Master en-Suits with custom cabinetry, hardwood flooring and decorative heating. The larger one to the right, has a walk-in closet with a walk through area where the laundry room is hidden. There's also an attached 800 sq ft apartment with separate access. The apartment is 800 sq ft and features a living room with French Doors leading to the back deck, a kitchen, full bath, and two more bedrooms! Great for out of town guests or even possibly an Airbnb rental if you'd like to supplement your income. There's plenty to see, come take a look!